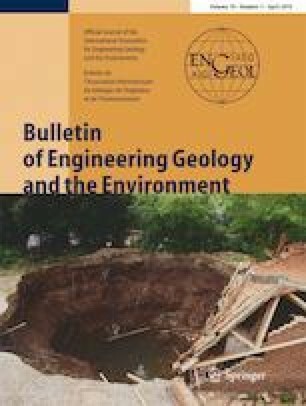 This paper evaluates the weathering behavior and weathering degree of basalt from the Wudalianchi UNESCO Global Geopark in the north-east of China. The geopark possesses the most typical and perfect geoheritage examples of a modern volcanic eruption activities in China. Laboratory experiments were conducted on basalt samples to simulate basalt’s weathering process under different environmental conditions. The basalt samples were subjected to either 10 rain cycles or 375 heat-cool cycles. After different numbers of cycles, the weight loss, ultrasonic velocity, and 3D surface morphology were quantitatively evaluated. All the treatments led to sample weight loss. However, the different factors (i.e., water and temperature) result in different degrees and patterns of basalt weathering. In the rain cycles, the sample surfaces became smoother, but new pores were detected. The coupled effects of the mechanical erosion by rain and the tensile stress generated by water invasion and air escape are considered the primary mechanism of grain detachment from the sample surface. In the heat-cool cycles, the sample surfaces became rougher, and the sample’s mechanical properties display a decreasing trend with an increase in heat-cool cycles. Thermally-induced stress led to grain detachment in the sample surface and internal particle dislocation, which initiates internal cracks. The experimental results have direct significance for the protection of basalt in the Wudalianchi UNESCO Global Geopark. The authors would like to acknowledge the financial support from the National Natural Science Foundation of China (No: 41602329) and Fundamental Research Funds for the Central Universities (No: 2652017073).